For in Scheme 1-30 bodies to determine support reactions. 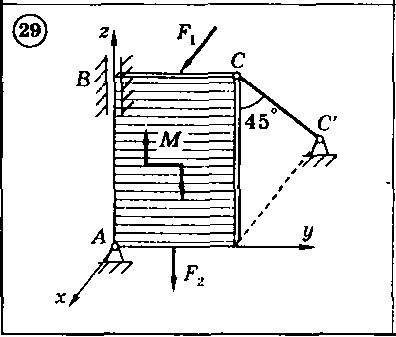 The body is a homogeneous rectangular plate weight G = 12 kN, a measuring | AB | M = 6 and | BC | = 2 m. Plate fastened via three supports: hinge-fixed bearing (spherical joint) at the point A, podshibnikovoy support point B and the supporting rod at the point C. On the plate acts: a pair of forces with the moment M = 10 kN * m and in the middle of the parties concerned - horizontal force F1 = 6 kN and the vertical force F2 = 8 kN. Right after the payment you receive a link to the archive with the solution of the problem in theoretical mechanics C5 B29 (Figure 29) in the test book "theoretical mechanics" Dievskaya VA Malyshev IA 2009 for university students.